Vitaliy Kaurov suggested that I cross post this StackExchange original here. It's an enjoyable way to work, as a lot of the busy type definitions and additional syntax required by other languages is not needed here; the code is quite compact and the intention fairly readable (IMHO). 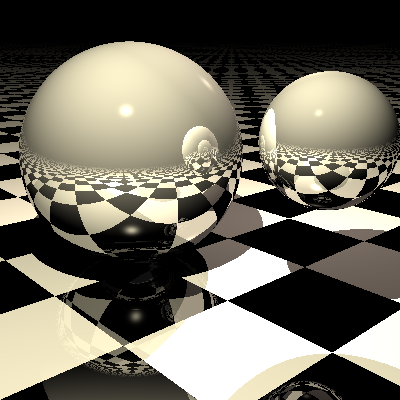 I have built the ray tracer from scratch, without using the built-in graphics primitives as that would defeat the learning purpose of the exercise and I would probably not be able to roll my own shaders. As a simple example, addition is not defined for RGBColor, for example. Probably as a consequence, the tracer is very slow, even if I use all the 4 kernels that are available to me. I dare say that the existing code could be speeded up considerably by removing all the type / pattern matching, but the code would be much harder to follow, I think, and certainly much harder to debug. My approach seems to mean that I cannot take advantage of Compile optimization, so far as I can see. If I wanted a fast ray tracer I would write it in C++, but I wonder whether there are any easy optimizations that I have missed (and that don't involve mangling what I have to the extent that the prototyping benefits of Mathematica -- easy refactoring -- would be lost). However, I am surprised that even with 4 kernels, the cpu of this 4-core (8-core, if you count hyperthreading) never maxes out. For example, is it worth changing some of the := to =? Things would be even slower if I aliased the results by averaging 4 adjacent traces, for example. Real time ray tracing seems out of reach. 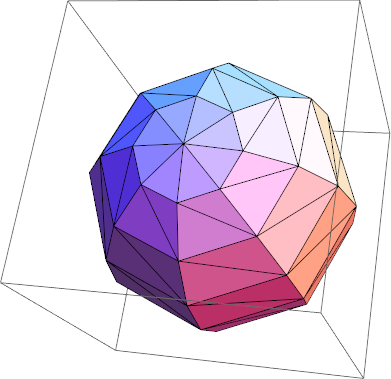 Ray tracing results in a lot of "corner cases" that are dealt with naturally with IEEE maths. Unfortunately Mathematica does produce +/-Infinity for +/-1/0, for example, so some of the code should really be extended to treat those cases properly. It would be great if Mathematica had more built-in vector algebra so that I could write the equations defining the objects and the rays involved and getting Mathematica to calculate the ray intersection points that are at the heart of the ray tracer. As things stand, Reduce and Solve have not helped me to find better intersection algorithms, producing either nothing at all or something large an unintelligible, depending on how I posed the problem.